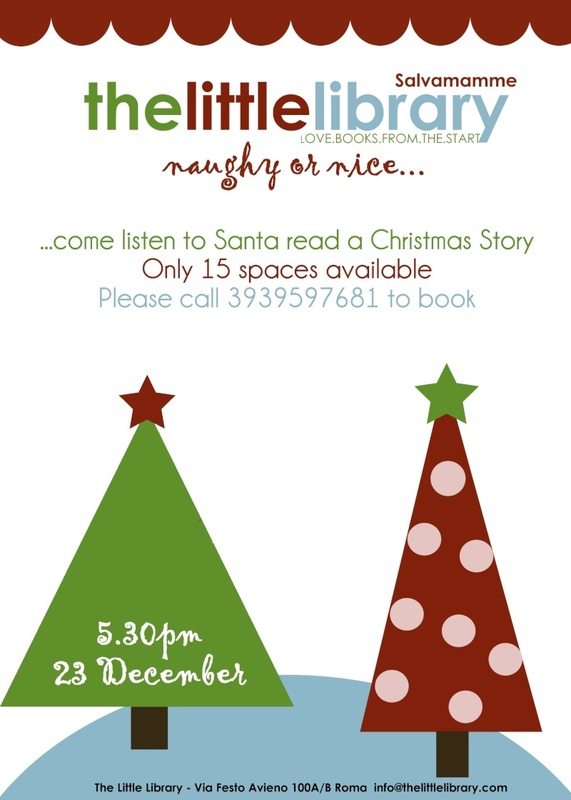 If you want to bring your child(ren) to come and listen to ‘Santa’ read a Christmas story, while you catch up with other English-speaking parents and enjoy a glass of wine and a mince pie, we’re holding our first little library event on 23 December. It will be held at the newly-opened little library in Balduina and will take place at 5:30pm. The event should last around an hour and entrance is free (although a donation would be great). You will, however, need to book a space. There are only 15 spaces available so if you want to come along, please either let me know via this site or call Silvia on the number below. We will run it on a first come first served basis. That sounds lovely. If I just lived nearer I would be the first one banging on the door (not least for the idea of kids being entertained whilst I drink....way to go!). Is there a case for a similar establishment in Ostia, or at least South of Rome???? Oh what a shame you're too far away to come Lizzie. You sure you can't make it? It's a ten minute walk from Balduina station. there's just no way...a bus, a train and a metro (with a change at termini), with 3 kids, a double buggy (and a bad back) and it will be dark....u just need to throw in a fire and some water and u pretty much have my worse nightmare!!! Hope u guys have fun!...I will forward the advert to my friend who lives in Rei di Roma....she may be interested!